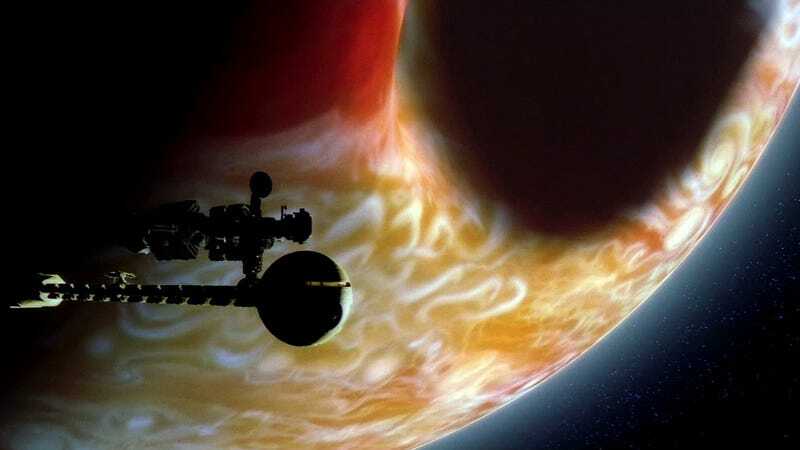 In the 1984 film 2010: The Year We Make Contact, aliens turn Jupiter into a mini-star. Jupiter is often referred to as a “failed star,” leading some futurists to wonder if our descendants might set it ablaze in a process called planetary stellification. A new study suggests this is indeed theoretically possible—and that we should be on the hunt for galactic aliens who have already converted their gas giants into stellar objects. In a speculative paper soon to be published in the Journal of the British Interplanetary Society, physicist and astrobiologist Milan M. Ćirković from the Astronomical Observatory of Belgrade presents an entirely new way for SETI scientists to search for signs of advanced extraterrestrial civilizations. Inspired by the work of British physicist Martyn J. Fogg and his suggestion that we turn Jupiter into a kind of mini-star, Ćirković says we should start looking for “stellified” objects in other planetary systems as signs of alien astro-engineering. Those of you who have read Arthur C. Clarke’s sci-fi classic 2010: The Year We Make Contact (1982) should be familiar with the concept of planetary stellification. In this novel, the alien Monoliths turn Jupiter into a small star. This causes the Jovian moon, Europa, to transform from an icy wasteland into a verdant jungle. Seven years after this book was written, Martyn Fogg took this very science fiction-like concept and turned it actual science. In his 1989 paper, “Stellifying Jupiter: A first step to terraforming the Galilean satellites,” Fogg explained how this astounding feat of astro-engineering could actually be accomplished. The idea is to release the gravitational energy of the gas giant by inserting a miniature black hole directly into the mass of Jupiter. In contrast to the nuclear fusion energy of our Sun and other “normal” stars, the mini black hole would devour Jupiter’s mass from within in a process known as accretion, forcing the release of large amounts of energy. This energy would be absorbed and radiated repeatedly as it makes it way out towards Jupiter’s surface. Eventually, this energy would reach the surface and spread outwards through space like any other stellar illumination. By stellifying Jupiter in this way, Fogg said we could turn the Galilean satellites into warm and habitable places. What’s more, we could construct a sort of mini-Dyson shell (or swarm) around the stellified Jupiter to capture the outflowing energy. In fact, this idea is so good, argues Ćirković, that we should assume advanced aliens are already embarking on these megascale projects. He believes it’s a reasonable application of the Copernican Principle, i.e., the idea that we’re not special or unique in the large scheme of things, and that alien motivations are likely to mirror our own, namely an ongoing desire for energy, habitat, space, fuel, material resources, and so on. In the time since Fogg wrote his paper, we’ve also learned a lot about black holes and how they work. Though it may sound outlandish and incredibly dangerous, Ćirković speculates that an advanced posthuman or extraterrestrial civilization will be able to create a mini black hole in the lab, feed it matter in a controlled manner, and then charge it electrically so that it can be maneuvered with strong electric fields. Of course, the process of planetary stellification will be fraught with peril, and it may not be worth the risks. Anything dealing with black holes—even miniature ones—will be exceptionally dangerous. Ćirković worries that an error, or even a terrorist plot, could cause the mini black hole to fall into Earth, or some other inhabited planet. “Also, in the latter phases of stellification, after about 100 million years or so, the stellified Jupiter will be extremely bright and might become quite unstable,” he said. “This could jeopardize the rest of the Solar System, or an analogous planetary system for extraterrestrial stellifications.” This will require further astro-engineering interventions. “Such tremendously advanced technological civilizations are likely to plan for all kinds of contingencies and things which could go awry,” he said. The simplest test will be to search for stars that are too small—both in terms of mass and radius—for them to be giving off a certain level of brightness, or luminosity. Also, if the suspected stellified planet is in a binary system, and especially if it is located in a binary system with one or more planets in the habitable zone of its companion, it could be an excellent candidate. The problem, according to Ćirković, will be in discerning natural from artificial processes, and we may become the victims of selectional effects. “We are so accustomed to looking at entirely natural processes of stellar structure and evolution, that we use luminosity to determine things such as radii, ages and masses, which will lead us astray if we are looking at an artefact,” he said. As Ćirković points out in his new study, we already have the telescopic technologies required for the search, so we can start any time. The only major obstacle is the potential lack of interest. That said, he is is encouraged by the recent trend toward “Dysonian SETI”—the search for alien megastructures, such as Dyson spheres. But as the infuriating and mysterious “dimming star” KIC 8462852 is revealing—and as Ćirković himself admits—it will be very difficult to prove that an anomalous stellar object is representative of an advanced alien civilization. But over time, as our telescopic technologies improve, and we gain a better understanding of what we’re looking for, we may finally catch a glimpse of extraterrestrials at work.